Hyon Gyon’s No-Mad Nomad brings together a grouping of the Korean artist’s large-scale canvases. 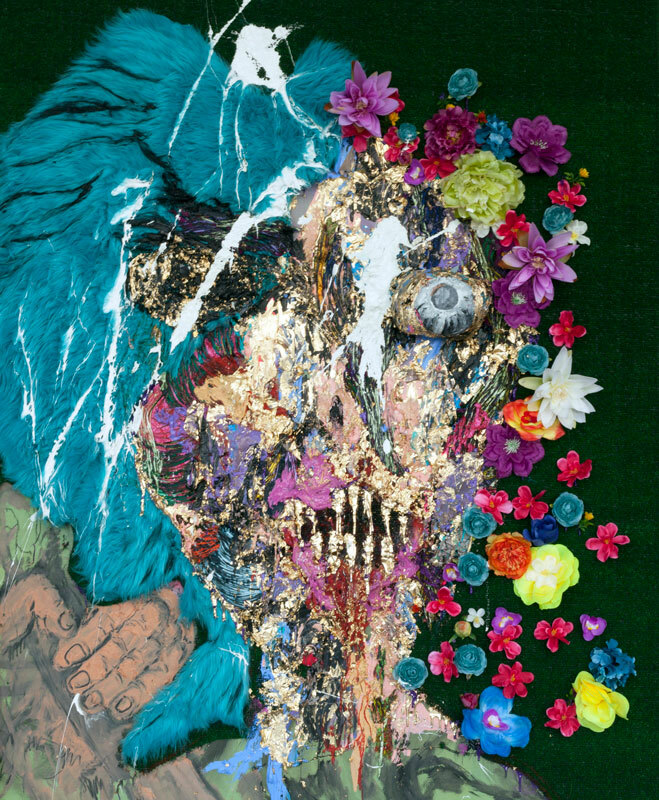 Appropriating finely-shredded cloth, fabric scraps, wax, and other objects—such as shards of glass and fur forming snarled teeth—many of Gyon’s paintings depict a fearsome Korean shaman, while others more abstractly evoke a kind of existential, debris-ridden dread. One work features a vortex of childhood playthings; flattened stuffed animals revolve around a pseudo-face of sticky gold leaf, while a cheap, plastic doll is attached to the painting—rather brusquely—by its head, limbs hanging limply in the air. Both frightening and funny, Gyon’s work looms existentially in No-Mad Nomad, vacillating between representation and abstraction, the mystical and the everyday.